There seems to be an inevitable march towards legalizing some recreational drugs. That's not to say that it's right or wrong, but it does offer an interesting scenario to contemplate. Heavy Metal is big on intriguing scenarios and Narcopolis: Continuum #1 offers one such scenario. The issue is written by Scott Duvall, illustrated by Ralf Singh, colored by Nicolas Chapuis and lettered by Taylor Esposito. In the near distant future, genius inventor Ben creates the ultimate drug. No ordinary narcotic, its effects will take Ben on a trip through time in an attempt to uncover the truth behind his father’s disappearance twenty years ago. In searching for answers, the past reveals its secrets that the young scientist won’t accept, even if it means risking everything he’s worked for. There's a lot crammed into Narcopolis: Continuum #1 and Duvall is keen on giving the reader as much information as possible. The lead character is Ben and he seems to have a pretty big role in the grand scheme of things, even if what his research is geared towards remains something of a mystery. The grand scheme of things is a world rife with drug users, but so far it seems that Ben is really only trying to get back the memory of his father maybe. He's insistent on testing a new formula he's discovered on himself, yet his motivation for doing so is murky at best (and even contradictory at other moments). There's an erratic nature to the book that's not helped by Duvall's pacing which feels a little scattershot, jumping from universe building to Ben back to universe building. The depiction of the action by Singh feels rigid, as best evidenced by the presentation of the characters themselves. The book doesn't really rely on a lot of fast-paced action sequences, but the fact that even calmer scenes feel static doesn't give the characters much physical heft. Singh doesn't really emphasize filling out the backgrounds that much at all, typically relying on a baby blue background to starkly contrast with a character's appearance in the panel. The panel layout feels pretty formulaic and doesn't really do much to make the art stand out any more. Chapuis does manage to infuse some life in the seemingly sparsely populated backgrounds with very slick colors that cast a blue pall over the action. 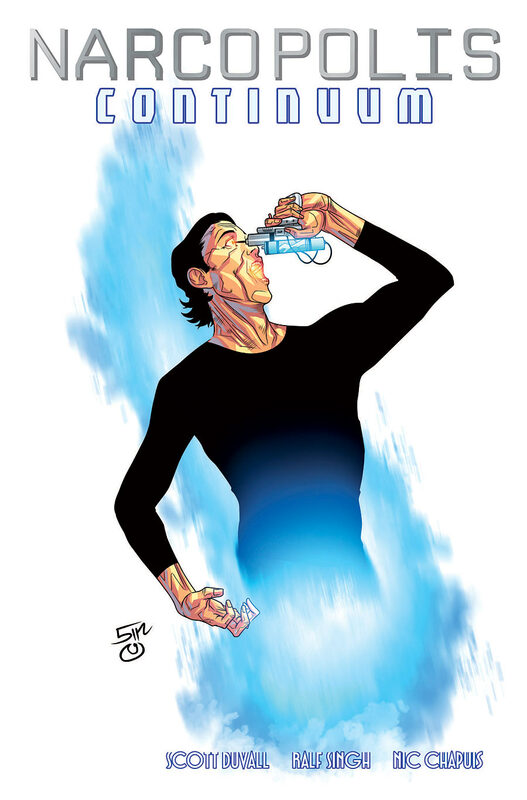 Narcopolis: Continuum #1 has a story at its heart that it wants to tell. The problem is that the story feels a little disjointed and all over the place. Duvall does an admirable job of holding it all together, but the story suffers from fairly bland characterization. Singh's illustrations seem to rely on a few basic facial expressions and body positions. Narcopolis: Continuum #1 is a story about time-traveling and science fiction, but it's bogged down by inconsistencies in both the story and the art. That's not to say that things won't even out--there's just a lot happening in the first issue. Narcopolis: Continuum #1 is in stores December 30.